Westfalia střecha z béžového plátna a 3 okna. Plachty pro většinu modelových roků jsou k dispozici buď s jedním, nebo třemi okny v původní barvě oranžové, žluté, šedé, nebo béžové. Okna mohou být otevřena na zip a jsou síťované proti škůdcům. Přední okno lze také otevřít. Látky jsou stejné jako originální materiál a vyznačují se barevnou stálostí. Pokud jste držiteli modelových roků 1967 až 1979 (panorama Bus), zkontrolujte zda je otočný bod zvedací střechy přední nebo zadní. V takovém případě nemusíte vybírat podle roku výroby, ale podle otočného bodu. 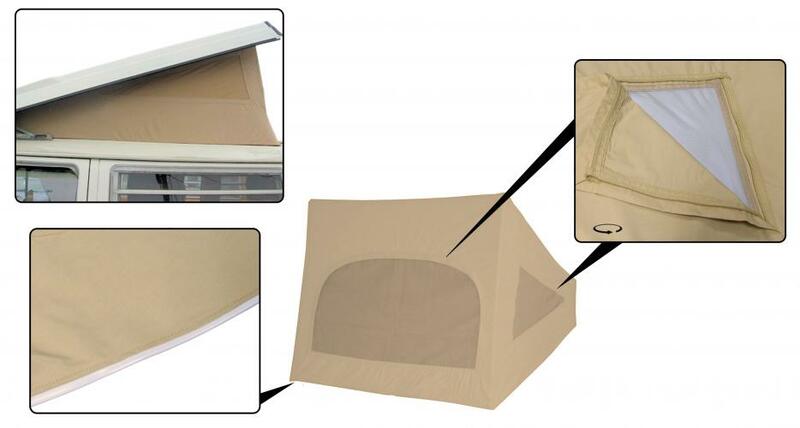 Westfalia roof canvas 3 windows beige. Hefdak canvas, to create more space, most RV builders used a lifting roof which was provided on the sides of canvas with cutouts (windows) for additional fresh air. Westfalia has from the start been working closely with Volkswagen, VW delivered the body and Westfalia built this to go camping. There are now few remaining classic Volkswagens where the fabric is still in good condition, over time, the weather, or are there holes in the original color has faded by the sun. All the more reason to go here pay attention to so that your holiday is not disturbed by irritation in any case. Before you begin, it is advisable to first make some pictures of the current situation, which can later be useful as a reminder during replacement. The tarpaulins for most model years available with either one or three windows and the original colors orange, yellow, gray or beige. The windows can be opened from the inside with a zipper and has a hor against pests, in the front window can also be opened hor to access any mounted luggage rack access. Our fabrics are equal to the original in material, color fastness and fit and thus the most fitted tarpaulins by professionals. The band finishes the fabric neatly in the aerial part as an extra option, take this there any extra. The following overview shows all tarpaulins mentioned belonging to the Bus and built only for hatches which are uses. Westfalia If you are in possession of a bus between the model years 1967 and 1979 (panorama Bus) check to be sure that the pivot point of the lifting roof is from the front or the back standing, it may be that you have a camper where afterwards a Westfalia roof is placed on the year and thus does not correspond to the pivot point, in which case you do not look to the year but to the pivot point. Páska bílá pro Westfalia střechy délka 8 m.